Hexadecimal Sudokus (also known as 16x16 Sudoku) are a larger version of regular Sudoku that feature a 16 x 16 grid, and 16 hexadecimal digits. Each row, column and 4x4 block contains all the digits 0 thru F (or numbers from 1 to 16, in the decimal versions). My Hexadecimal Sudoku puzzles are collected in 100 printable booklets per volume. Within each volume, the puzzles are also ordered by ascending difficulty. Each booklet contains eight puzzles, instructions, hints, and answers. Puzzles are available in both hexadecimal (0-F) and decimal (1-16) notation. These puzzles require basic Sudoku strategy. 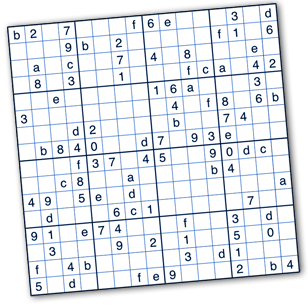 If you have not solved Sudoku puzzles before, you will probably find them quite difficult! These puzzles require more sophisticated Sudoku strategy. Tough puzzles require more advanced Sudoku strategy, such as X-Wing, XY-Wing and Swordfish. These are the toughest Hexadecimal Sudokus I make, and may require a little trial-and-error to finish.